In which we finally get to The ROSWELL SLIDES! SATURDAY FEB. 21, 9AM: Richard Dolan. "UFOs: The Real Power Structure and the End Game"
He Talked about a shadowy secret power structure, involving the military and Wall Street. Dark money goes into secret technologies. anti-gravity etc. They are weaponizing recovered technologies, and mind control technologies. "Breakthrough technologies" are based on recovered ET technology. There is a group of "others" who have been here a long time. ETs? They have powerful telepathy. "Disclosure" as people envision it will probably not happen. It might open individuals in positions of power to criminal prosecution. They would never risk it. The UFO cover-up is international. Brazil, India, China, many nations involved. The conspirators - primarily, the U.S. - use bribery, blackmail, and threats against foreign leaders. NSA has been spying on them. Fearing the consequences, they comply with the cover-up. Breakaway trans-national organizations are being formed. Nations are becoming less relevant. He gave a conspiratorial analysis of Middle Eastern fighting, centering around a proposed "Islamic Pipeline" that would undercut Russia's energy dominance in Europe. Putin is hoarding gold. The conspiators' goal is a police state, fascism. Government and corporate dominance. Disclosure, if it could be obtained, would prevent this. Fascism would lose, and we would have "Power to the People," if some future president tore free of these encumbrances, and disclosed the presence of aliens. Afterwards we ran into each other several times, and had some nice chats. I told him that I found it impossible to believe that the U.S. government is able to make the likes of Putin or Iran's Ayatollahs do its bidding. If that were so, we would have dissuaded Putin from swallowing up several provinces in Georgia and the Ukraine (unless UFO secrecy is so much more important than that!). Dolan's vision of a global cover-up is, in my view, impossibly large and unwieldy. We agreed that we should have more discussions at future events. The title of his talk is "BREAKING NEWS," meaning the most significant UFO developments of the past year. "New video technology shows that there are not just invisible UFOs close to us but even invisible creatures," says the program. Maussan has a 2-hour weekly program on national TV in Mexico. We have so much evidence to promote every week, he says. He showed a photo of a huge "invisible" UFO seen in Las Vegas at sunset. A big translucent UFO was hovering behind the Paris casino Eiffel tower on the Las Vegas Strip. It was only seen because it was "reflecting the sun." He showed a NASA Curiosity rover photo of a "woman" on Mars (although in my opinion she looks like Bigfoot). What looks like a rock is really a Martian house made of stones. A UFO is seen hovering over Mars. A UFO video from Russia is clearly a reflection of a flashlight on a window. A UFO was seen in the Rosetta photos of Comet P/67. Amazing sounds were coming from the comet (in space). Maussan showed dozens of low-grade UFO videos, from the US and elsewhere, all from the past year. Dots of light in the sky. UFOs going in and out of ''portholes," this has been proven. The statue of Liberty UFO video. Still no mention of the Roswell Slides. Next he showed his best UFO videos from Mexico, starting from 2004. Then videos of "Shadow people" - semi-visible shadowy beings. They look like dark smudges, just a blurry dark spot, sneaking around. One sat in a rocking chair, and rocked it. One entity "Shadowed" Maussan in a crop circle. Then there were "Invisible UFOs". Night-vision UFOs (flocks of birds). Two minutes before his talk's scheduled end, Maussan said "I want to talk about something very important." The Roswell Slides? Nope! From Brazil we have a video in which the aliens are producing a strange sound. (A deep musical hum). Then he showed a solar balloon in Los Angeles. Weeping statues worldwide. The face of Christ in the clouds. His talk ran five minutes late (I know this was frowned on, as they attempt to stick very closely to the published schedule). Then at that point, Maussan unexpectedly brings Adam Dew onto the stage, and promos his unveiling of the Roswell Slides in Mexico City on May 5. He showed a brief English-language video "beWitness." The narrator has Spanish accent. Donald Schmidt & Tom Carey will be there in Mexico City, as will moonwalker Edgar Mitchell. 3D & holographic technology will be used, to present the evidence as never before. Afterward, a number of people sought out Maussan, but nobody was talking to Dew. I introduced myself to him, and began asking him questions. How did you first obtain the slides? The slides were found by the sister of my friend as she was cleaning out a house to be demolished in Sedona, AZ. They said, Adam is a video expert, let's give the slides to him. Who is the owner of the slides? My company is the "owner" of the slides, it controls the slides. How did Schmitt and Carey get involved? I've spent two years researching and investigating the slides. I wanted to speak to people who have seen the bodies. How did Maussan get involved? Schmitt and Carey brought him in. Maussan offered a nice package. I explained how the fact of Maussan's involvement made many knowledgeable people in the UFO field immediately suspect a hoax, given his reputation for promoting many UFO hoaxes in the past. I had the impression that Dew, clearly a newcomer to UFOlogy, was not familiar with Maussan's oeuvre, or his reputation as a purveyor of rubbish. I suspect that Dew did not realize how much trouble bringing in Maussan would cause. He felt that some people were being very unfair and making unfair accusations about the slides, that they have not even seen. I referred to Maussan's just-concluded talk, invisible beings and such, as illustrating my point. "Was all of it fake?" "Yes" "How can you prove that?" I explained that the burden of proof is on Maussan to show that his wild claims are valid, not on me to disprove them. Dew agreed. I'm interested to bring this thing to the public, to people who don't know Maussan. I just did an interview about this in Chicago, on WGN. Adam Dew interviews the interviewer - me!! A few minutes later, Dew came up to me and asked if he could interview me about the slides! I agreed, and signed his standard release form. We talked about the controversy over the slides. I explained how Maussan's involvement made people extremely suspicious of the slides. He said to me, You realize, I hope, that nobody gets rich making documentary films? Look at my crew, he said, pointing to himself and his camera. I replied, yes, I have heard that before (I was thinking of similar comments made by Paul Kimball, when he took on the late Roger Leir.). But in a few cases, I explained, large sums of money have been made, the most obvious example being Ray Santilli's Alien Autopsy hoax twenty years ago. Dew was indeed familiar with this. When the Alien Autopsy video was shown on TV, it got tremendously high ratings and made a lot of money, even though most serious persons realized it was probably a hoax. But that couldn't be proven yet. By the time that the hoax was exposed, Santilli had already made a great deal of money on it, and I said that many people think that you, Mr. Dew, will travel that same path. So I ended up comparing him to Ray Santilli, by which he seemed slightly taken aback, but I think he saw the reasoning behind that and took it humorously and without offense. I closed repeating the observation that "extraordinary claims require extraordinary proof," and that two photos of unknown origin, no matter what they seem to show, cannot possibly suffice to prove the reality of crashed saucer aliens. He seemed to agree with my point. So if someday you see my face in one of Dew's videos about the Roswell Slides, don't be surprised! I asked Dew did he live in Chicago? He said yes, that's where I'm "based." I don't want to talk about where I live. He also told me, No matter what you hear on the internet, I really am a graduate of Northwestern University, in Journalism. I told him that I am a Northwestern graduate, too. Through a social connection, Dew obtains a collection of historical slides. He discovers that two of them seem to show what looks like a supposed alien body. Seeking out 'Roswell experts,' Dew (not surprisingly) happens upon Schmitt and Carey. He contacts them and shows them the slides. They share it with members of their "Roswell dream team." After convincing themselves that the slides seem authentic, Schmitt and Carey contact Maussan to arrange a profitable "unveiling" of the slides. Maussan presents an attractive offer which Dew accepts. The slides will be revealed to the world in Mexico City on Cinco de Mayo, 2015, which is also the twentieth anniversary of the premiere screening of Ray Santilli's Alien Autopsy video before an invited audience at the Museum of London. Afterward, assuming that the slides are authenticated, Maussan told an Italian journalist that John Rao, the wealthy businessman who operates Open Minds (the promoters of the International UFO Congress), has expressed an interest in buying them. Assuming that takes place, next year's UFO Congress (already scheduled to take place in the same location) will presumably have the Roswell Slides displayed in a glass case. A well-known television journalist in Las Vegas. He was the first to interview Bob Lazar, who he compares to Edward Snowden, who blew the whistle on NSA spying. Knapp says that the comparison is valid. Knapp basically defends Lazar's reputation against 'unfair' charges. He told a lot of alien jokes that were mostly pretty funny. He is certainly a good entertainer. Knapp says he knows of dozens of Area 51 veterans who confirm Lazar's descriptions at least in part. Special Q&A with Bob Lazar and George Knapp. Questions for Lazar had to be submitted in advance at the registration desk, for Knapp to ask him. Asked what he is currently doing, Lazar explained that he is basically in the business of selling radioactive and otherwise dangerous stuff. He said, "I unfortunately live in Michigan." He says he moved there because the state promised aid for his business, but implied that he was disappointed in what he actually received. In his previous home in Nevada, he had a 30 ft particle accelerator(!). Lazar drew an illustration of a supposed saucer hangar at Area 51, and did several other illustrations. These were all ARVs, Alien Reproduction Vehicles. He talked about gravity amplifiers. They run on element 115 (Lazarium? ), of which there were 500 lbs at Area 51. The craft distorts space-time and pushes itself along. Since Lazar first told his fables about "Element 115," scientists have actually synthesised that element, albeit for an extremely brief period of time. It did not turn out to be a stable element, as Lazar claimed it was. At the Evening Banquet, awards were given out. A "lifetime achievement award" was awarded to the late Dr. Roger Leir, a California podiatrist who would remove what were claimed to be "alien implants" in people. The Film Festival award for best documentary went to the movie Travis, that I wrote about in the previous installment. There was much picture taking at the close of the banquet. I was asked to take photos of a group of people that included James Gilliland. Because that phone was very different from mine, I accidentally took two brief videos instead of still photos. One of them included a fast-moving object that was immediately described as an "Orb" (orbs are supposedly paranormal phenomena that are sometimes seen in photos or videos where psyschic powers are involved). I said I thought it was a tiny moth, attracted by the light on the camera. It could have been either one, I suppose. When I was on Dr. J's internet radio show Dark Matter a few days later, the woman in the photo called in to tease me about my psychic ability to cause orbs to appear. I did not attend the Sunday session. However, I heard from a friend that there was a great shouting match between Stanton Friedman and Jeremy Corbell on the final panel. Friedman kept laying out his reasoning of why Bob Lazar is a fraud while Corbell defended him. The two of them argued for about 30 minutes straight. I'm told it was the best drama and entertainment of the entire event! Here is a Twitter report on Friedman vs. Corbell. On Friday Morning, February 20, the first speaker was Ruben Uriarte, longtime MUFON investigator and State Director for Northern California. I first met Ruben on the UFO Tour of Mexico we took in 1996. He was one of the organizers. We didn't see any UFOs, but we saw some great places in Mexico and had a lot of fun. It was good to see him again after many years. His subject was "Border Crossings of the Third Kind," or UFO crashes in Mexico. He re-hashed the MJ-12 papers & the FBI memo, also the Marfa Lights and the Star Child Skull. He pointed out that in the movie "Earth vs the Flying Saucers," a high-frequency beam is used to bring down the saucers (as is claimed about the Aztec and some other "UFO crashes."). He showed video excerpts of his appearances on the "History" channel. Ruben discussed 3 UFO crashes in northern Mexico in the 1950s. One in Chihuahua is reported to involve alien bodies. The U.S. military is said to have been present assisting the Mexicans. Some witnesses claim to have seen an "explosion" in the sky, and also strange creatures. One of the crashes supposedly occurred in 1948, near Laredo, Texas. It has a photo of a burned and dead being commonly known as "Tomato Man" Unfortunately, Ruben's investigation is a little behind the time. Later investigation has shown that Tomato Man is a dead pilot, and is definitely terrestrial. Next was James Gilliland, who calls his group ECETI - Enlightened Contact with Extraterrestrial Intelligence. He has a ranch in rural Washington state, where he and those who visit him claim to see all manner of implausible things. In fact, he says that ET ships have been seen at his ranch every night for thirteen years! Gilliland showed a night vision video of bugs flying about. He also showed some photos of Fairy Beings and Gnomes obtained there. Among the claims that Gilliland made in his alloted time: Chemtrails, Black Helicopters, microwave psychotronics (i.e., mind control), and beings coming through a wall. We have cures for everything, but it's being suppressed. He showed videos of a door that opens up in the mountain, and objects go in and out. (You have to use a lot of imagination to see that door.) He showed a video excerpt from the show Paranormal State Illustrated where "psychic" Chip Coffey came out to the ECETI ranch, and predicted the time of a UFO appearance. However, since UFOs are apparently seen there almost constantly, the prediction, while reasonably specific, was not surprising. Gilliland plaintively asked: with so many sightings, why is the ECETI group marginalized, even in the UFO community? Earth to James: even many UFO believers have a limit of how many weird claims they are willing to accept. Next Joshua P. Warren spoke on the Brown Mountain lights. He has made extraordinary claims on just about every 'paranormal' cable TV show there is. He mentioned the USGS investigations of the alleged lights, and just about everything he said about that was counter-factual. The USGS could, and did, explain the lights. This has been written about in UFO books for decades. He thinks that the lights are naturally-produced plasmas, and that reports of strange military activity in the area means that the military wants to study the lights. He showed a few videos of Bug UFOs, then talked about the "Wishing Machine" he is selling, which operates using the "Law of Attraction." He also teaches an expensive seminar on how to use that machine. A crowd lines up to check out the "Wishing Machine" of Joshua P. Warren, which uses the "Law of Attraction." Next was Mark Pilkington, whose book (now also a movie) Mirage Men purports to show how military and intelligence operators have shaped and exploited belief in UFOs. He called his talk "The Abuses of Enchantment." I would have to say that Pilkington is not a man who gets directly to the point. But good olde Stanton Friedman, the Flying Saucer physicist, wasn't having any of this. During the Q&A period (Pilkington was among the few speakers to actually allow time for a real Q&A), Friedman, who says he is fully recovered from the heart attack he suffered last year, laid down the gauntlet: this was "effective propaganda," he said, and asked Pilkington "Who are you working for?" You, Friedman said, might be part of the Disinformation campaign. Leda Beluche, GirlieVegan Energy Healer, poses with the plastic aliens of Australian artist Alan Groves. He says that he did these sculptures during the past two years. I asked, "So these are not the same plastic aliens that Boyd Bushman photographed?" "Not the same ones," he replied, "mine are much better." This collection of mirrors is a "Moonlight Collector," which will focus the rays of the moon (or bright star) where you want it. This of course results in "healing." This reflector is actually mounted on a goto telescope mount, which can track celestial objects. However, while the mount can be made to keep the mirror pointing at the same object, it does NOT keep that object's reflection fixed! At the Film Festival in the evening, I stayed to watch the new movie Travis, which tells the story of the alleged UFO abduction of Travis Walton in 1975 (as does the 1993 Hollywood film Fire in the Sky, which they says is less accurate in depicting the "facts"). The movie is pretty well made, telling the story of the alleged abduction, albeit by a highly selective presentation of events. Much is made of the six woodcutters, five of whom barely knew Walton at all, passing a police polygraph test. This is not as significant as they make it, because the questions asked were primarily to determine whether Travis (still "missing") was murdered, and his body dumped in the woods. Most likely only Travis and his buddy Mike Rogers (driving the truck) were "in on" the hoax - the other five woodcutters had no idea what was going on. Hence they could truthfully say that they didn't murder Travis, and they saw an unknown object in the woods. At least one other person needed to be in the woods, to work the light show. Completely concealed, however, was the fact that Travis had flunked a polygraph examination, paid for by the National Enquirer, and administered by the most experienced examiner in the state of Arizona, who concluded that Travis was practicing "gross deception." APRO (which was promoting Walton's story) and the National Enquirer concealed this embarrassing fact. Walton later passed a different polygraph test (for which he had adequate time to prepare), but failed a later one on the 2008 TV show Moment of Truth. In reality, if someone is anticipating taking a polygraph exam, and practices for it, they have a very good chance of fooling the examiner. The skeptic's case against the Walton "abduction" is summarized here on my debunker.com website. This movie clearly displays Philip J. Klass Derangement Syndrome, spending about ten minutes raving about him and denouncing him (the Walton camp hates Klass because he blew the whistle on Travis' polygraph failure, and other things, that they concealed). They repeat the unfounded claim that Klass tried to bribe Steve Pierce $10,000 to say that the case was a hoax (I have already shown that archive documents support Klass' version of events). After that movie, I went over to the pool area of the hotel where Ben Hansen was holding a sky view, to demonstrate some very expensive night vision equipment that he wants to sell to credulous UFO buffs. The sky was mostly cloudy, so Hansen pointed his camera at stars wherever the clouds weren't, and looked for anomalous objects. He didn't see any, and he explained quite well what was happening whenever an airplane or bird flew across the view. Such equipment, in the hands of someone who doesn't understand it well, will produce all kinds of "sightings" (mostly bugs, birds, aircraft, and satellites), but it won't show you anything that you can't see with a good pair of binoculars. 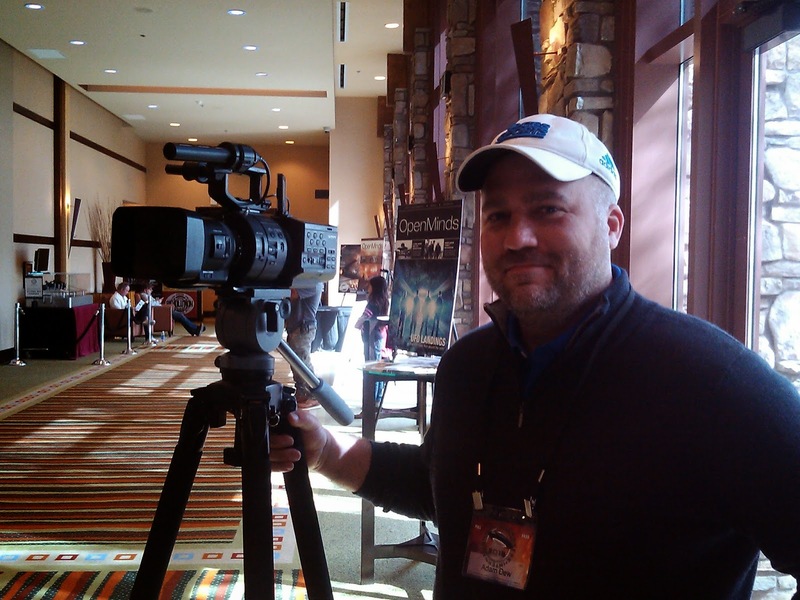 Again this year, I am attending the largest UFO conference in the world, this year's International UFO Congress Conference and Film Festival near Phoenix, Arizona. Unlike previous years, I was not able to attend all five days. Also I'm not going to try to provide a summary of every talk (although I said that previously!). 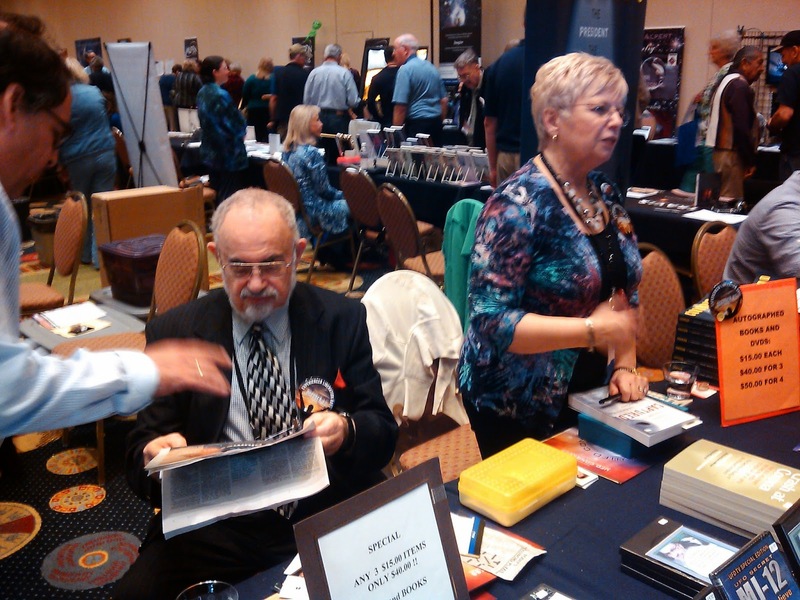 But there is obviously a lot going on here - most of UFOlogy's "heavy hitters" are here. Boyd Bushman is vindicated - Plastic Aliens are everywhere! 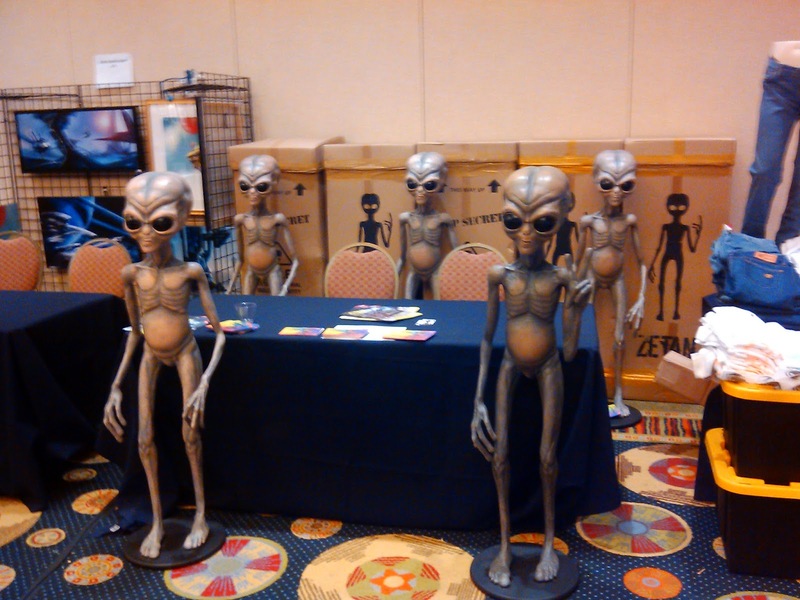 The first thing to catch my eye was the display here, and elsewhere, of what appears to be the same plastic aliens allegedly photographed by Boyd Bushman at Area 51. Some people wanted to see proof that such plastic aliens actually exist. Well, here it is. These cheerful fellows are 54" tall, are being sold by Zetan.net, and cost $488.00. 9AM. Substituting for Linda Zimmerman is Thomas Reed. The talk is on the Reed family UFO encounters and abductions, in various locations. He showed a long documentary video, mostly excerpts from cable TV shows, with hideously bad audio, and a loud hum. His case was supposedly mentioned at the UN in 1992. The same day, he says his father was murdered. He told of alien abductions and such, involving his brother and son. There allegedly were radiation and magnetic effects. His long and boring account told what the aliens supposedly did, but probably didn't. He hinted about family disagreements over UFO claims. 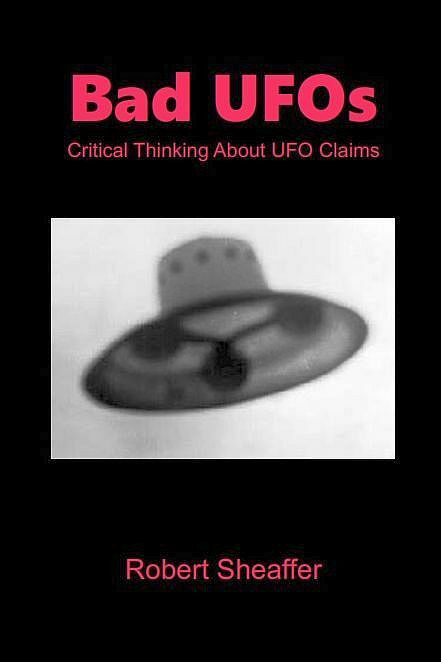 One questioner noted that his brother's account of their supposed UFO abduction is completely inconsistent with his. Thom explained how his brother is, of course, mistaken. But he confessed, "I didn't pass a polygraph test." Abductionist Yvonne Smith once came out to his house to "regress" him about his UFO experiences. The resulting video looked much like a scene from The Exorcist, with Reed writhing, panting, and thrashing about on the couch. Reed hired a lawyer to sue the government, or somebody, over what the saucers did to him. So far, no luck. He proudly announced that his UFO case has been accepted as the first true UFO case ever by some historical society somewhere. We are supposed to be impressed. DERRELL SIMS - the Alien Hunter! Sims had been laying somewhat low in UFOlogy but now is boldly moving into the territory until recently occupied by his former colleague, the late Dr. Roger Leir. Sims claims to have worked for the CIA, but he doesn't have any proof of that. A red-light camera in Los Angeles recently captured the image of an alien in the back seat of a car, abducting the driver. More bad alien photos, much like those of Jaime Maussan. Also of Bruises caused by alien hands on peoples bodies. When ufos in photos have blurry edges, it means they are in transit. Those with sharp edges are probes. Implants galore. However doctors often steal the alien implants after surgery. IR, fluorescence, etc. "M I B Sperm Detection" provides documentation of alien sexual assault. One woman was forced to copulate with a creature like a pig. One of his abductees assaulted hiscaptor with a sword. In the morning, he found a lump of alien DNA on the floor. Unfortunately, it was eaten by the dog, which died soon afterward. Sims told scary, home-style stories. The alien agenda is always hostile. Aliens sometimes masquerade as angels, but never vice-versa. Infact, aliens flee when angels appear, according to Sims. Continuing in the homespun vein, Chris O'Brien talked about cattle mutilations. He says he has investigated over 200 reported cases, of which about 40 are "high strange." He traced the parallel histories of humans and cattle, suggesting that our lives and our fates are linked in some mysterious way - and perhaps our DNA as well. Then he went into a ramblinmg discussion of all manner of weird conspiracy claims, everything from "mystery helicopters" to just about every conspiracy you've ever heard of, and a few you haven't. Charlie Foltz talked about the famous Allagash Abductions of 1976, of which he was one of the "victims." Also participating via Skype was another of the Allagash "abductees," Jim Weiner. Foltz had the appearance and mannerisms of Jonathan Winters, although his stories were not so entertaining. The incident occurs in the wilderness, preceded by a lot of climbing, a lot of camping, a lot of canoeing, etc. While they were in the wilderness, they saw a bright UFO, but did not remember any abduction. (Notice that this was before Budd Hopkins burst into the UFO abduction scene. Before that, you had to go out to some remote place for aliens to find you (B-B Hill, Travis Walton, Kentucky Abductions, etc.). After Hopkins' Missing Time, you didn't need to go anywhere. Aliens would come right into your bedroom and grab you.). Not until years later, when the Alligash Trio were hypnotized by Dr. John Mack, did this UFO sighting become an abduction story. Foltz finished up by trying to interest the audience in his nature paintings, and also in his services as a graphic designer. The afternoon ended with a panel featuring these four speakers, moderated by Yvonne Smith. The subject was Rare Cases of Mass Alien Abductions. Smith talked about her own favorite such case, which allegedly occurred in 1994 at a UFO abduction conference she had organized at the Hotel Del Coronado, near San Diego. She teased the audience with the possibility that they might experience a mass alien abduction tonight as well. Each of the four speakers then went on to talk about their favorite "mass abduction" case. A film about the surgeries of the late Dr. roger Leir to remove alleged alien implants from peoples' bodies. Dr. Leir illustrates how to find alien implants, using a stud finder. From Mexico City on Cinco de Mayo - the Roswell Slides! On February 1, Kevin Randle's Blog hosted a guest entry by Anthony Bragalia, who is researching the background of the "Roswell slides." Bragalia, arguing forcefully for the authenticity of the slides, announced that the "reveal" of the slides would take place in Mexico City on May 5. Why in the world would slides of partially-autopsied Roswell aliens be revealed in a program in Mexico City? Bragalia did not explain why. only the owner can answer that. I have indicated many times that we are only supporting his efforts in research and that any decisions about venue or manner of reveal is his alone. But why not? The official public announcement of the slides was made at American University in DC. Why not have the reveal of an item of global import be broadcast internationally and outside of the US? You are a Brit yourself, CDA yet you take extreme interest in Roswell. Don't be so US-centric. When Maussan's involvement was revealed, a collective groan was heard from just about everybody who knows anything about current UFOlogy. Anyone who has gone to a UFO conference anywhere in the last twenty years has likely heard a talk by Maussan, making wild claims and showing highly-dubious photos and videos. He is considered one of the least-credible UFO personalities active today. The page for ALCIONE (in Spanish) lists "more than 40 frauds" that Maussan has promoted. Tim Printy also has some interesting comments about Maussan. 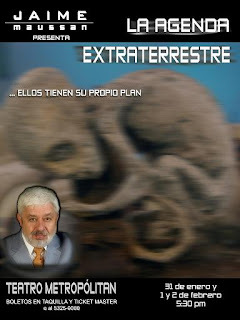 An ad promoting Maussan's 2009 'alien revelation' show in Mexico City. "ET Contact" was "immanent" six years ago. Why is Maussan involved in the matter of the "Roswell slides?" We don't yet know for sure, but presumably "the owner" sold the rights to the slides to the highest bidder, and the highest bidder was Maussan. It is also reported that a TV program about the slides is in production, but nobody in the know has publicly commented on this. Under "Great Mysteries of the Third Millennium," Maussan presents a video of a horse flying across the sky. Here Maussan interviews Tom Carey about the "Roswell slides." If you want to see lots of weird-looking creatures, go to Google Images and type in Jaime Maussan Aliens. Along those lines, here is a video of Maussan showing us aliens. Lots and lots of them. Don't worry if you can't understand the Spanish; he's just showing off his collection of photos and videos of aliens. And as of el prossimo Cinco de Mayo, Maussan will have two more photos of aliens to add to his already-impressive collection.